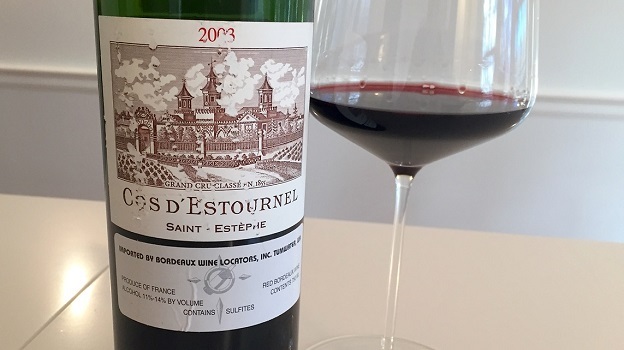 The 2003 Cos d’Estournel is a total knock out. Super-ripe and opulent from the outset, the 2003 is a big, ample Cos that takes over all the senses and never lets up. The bouquet alone – with its alluring notes of tobacco, cedar, spice, dark roasted fruits, leather and smoke – is stunning in its beauty. All of those nuances follow through on the palate, where the 2003 is thick, dense and concentrated. The 2003 is just beginning to enter the very early part of its optimal drinking window. Despite its very ripe feel, the 2003 needs further time in bottle to fully come together. Interestingly, the 2005 is quite a bit more expressive and rewarding to drink now. The 2003 is a superb Cos that captures the essence of this freakishly hot, record-setting vintage. Although the 2003 is the product of a very warm vintage, the wine was remarkably fresh, even two days after having been opened. In 2003 the blend is 70% Cabernet Sauvignon, 27% Merlot, 2% Petit Verdot and 1% Cabernet Franc. 96/Drinking window: 2018-2033.